For many, the beautiful landscapes of the Lofoten islands are synonymous with holidays, celebrations, peace and the perfect embodiment of the wild Arctic nature. However, in the Middle-Ages, very different stories were circulating about the beautiful archipelago, stories mostly revolving around…evil, magical Trolls? The Lofoten islands, despite being very well-known today were really obscure in the Viking and Middle-Ages. Despite the fact that people have been living there since the Stone Age, we have very little written information about the archipelago until maybe the 17th century. One exception to this rule however is the story of Ketill hængr, which has reached us in the form of a Viking saga, the exciting Ketils saga hængs which takes place in the early Viking Age but was probably written around the year 1250. This saga is notorious for the numerous monsters which fill the page of the otherwise quite short saga. Ketils saga has survived to this day through Icelandic manuscript such as this one, the AM 471 4to. 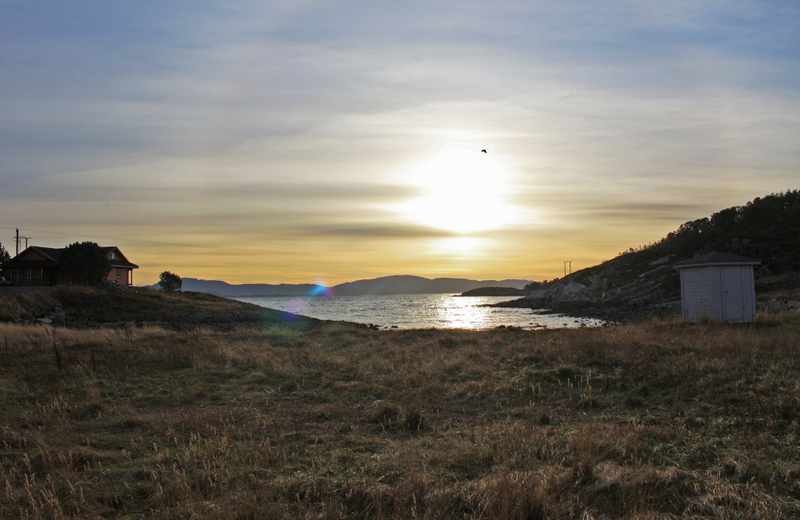 The story starts in Hrafnista, a little island off the coast of North Norway now know as Ramstad. Ketill is the son of the local chieftain, Hallbjörn Half-troll. Endowed with such a name, it is clear that Hallbjörn is a very big and strong man, respected by everyone on the island. The man’s sheer size and strength are the only reason why the locals tend to avoid talking about Hallbjörn’s rather mysterious and unknown mother… In any cases, his son Ketill is everything his father isn’t: quiet, peaceful, unassuming and not at all adventurous. Poor Ketill is mocked by everyone on the island and his father never misses an occasion to remind him of his glorious line of heroes: Hallbjörn’s father, Úlfr was remembered as “the unfearful“…Quite the contrary to Ketill or so it seemed! Nowadays Hrafnista and the region surrounding it is peaceful and remarkably troll-free. This situation goes on until Ketill reaches his teenage years. In this time, life was hard for the farmers of Arctic Norway and food became particularity scarce this year…One morning, tired of eating too little, Ketill borrowed his father’s rowing boat and, without asking anyone, rowed far up North to fish. he managed to find a pretty good bank and filled his nets to maximum capacity. When time came to land for the night, he discovered that the island he had reached was not exactly welcoming… Upon discovering a food pit full of bear, whale, and…human meat, Ketill realized that he had ended up on an island of…cannibal trolls! Before he could leave the island, he had to face two gigantic monstrous trolls, Surtr the Black and Kaldrann the Cold Moustache! Only barely fending off these terrible foes, Ketill managed to obtain victory and sailed shortly thereafter. When he arrived to Hrafnista with a bounty of tasty fish and the glory of having defeated not one, but two trolls, he immediately became the hero of the little island! Trolls were often described as vicious and loving nothing less than a good fight! This adventure wasn’t the last one Ketill would take part in by far! Just a few years following this first expedition, famine came back to Hrafnista. Once again, Ketill sailed his father’s boat and sailed even further, reaching the island of Skrova, an outlying island in the east of Lofoten. After fishing (probably some of the great Cod Lofoten has become known for), Ketill took his boat to shore. When he had his boat securely moored, he met face to face with…a Troll! This time, the troll was an old hag…Cunningly, Ketill managed to sweet-talk the troll-woman, calling her “foster-mother”. This worked well-enough and the terrifying matron started talking to our hero, saying that she, unfortunately had to leave his gracious company as she was expected in the very south of Norway, where she was to marry a nobleman!She then proceeded to jump into the water and turn into…a whale, which happily splashed its way out into the open sea. Somewhat confused by happy to have escaped the troll’s clutch, Ketill started walking to the woods in order to find some firewood. He had not even walked a dozen steps that he met with…yet another Troll-woman! Thankfully, this second troll wasn’t in the mood for human flesh either. She was instead very merciful, telling Ketill to run and hide, for this very night, the Lofoten islands were to host the infamous Tröllaþing, the assembly of trolls! The biggest and ugliest of all Norwegian trolls were gathering as they spoke: Skelkingr the terrible, king of the trolls from the Arctic sea, Ófoti the one-footed trolls, east from Lofoten and Torgerd, troll-woman of the Pagan altars… all and scores more were heading to the islands for a night of witchery no human had ever witnessed! Upon learning this, Ketill ran away, far deep into the wood, under a thick layer of branches, where no-one could see him. That night, Ketill could not manage to close his eyes for even a second, as hordes of trolls spend the whole night dancing, feasting and riding magical broomsticks all the skies of the Lofoten…. Ultimately, the sun finally rose and all the trolls disappeared as suddenly as they appeared, giving Ketill the opportunity to sail back home, not looking back over his shoulders, even once. This trip to the Lofoten islands was the last time Ketill sailed deep into the archipelagos of Arctic Norway. This night of trollish witch-ride was certainly enough even for a courageous lad like him! Even if Ketill was just about done with facing trolls and other giants, his family had to carry on the good old tradition a couple generations more, but this is the stuff for another story, to be told some other time! (1) Ketils saga hængs (1954). In Guðni Jónsson (ed. ), Fornaldarsögur Norðurlanda, Vol.II (149 – 181). Reykjavík: Íslendingasagauútgáfan. (2) The Hrafnista Sagas (2012). Ben Waggoner (trans.). New Haven: The Troth Publications. 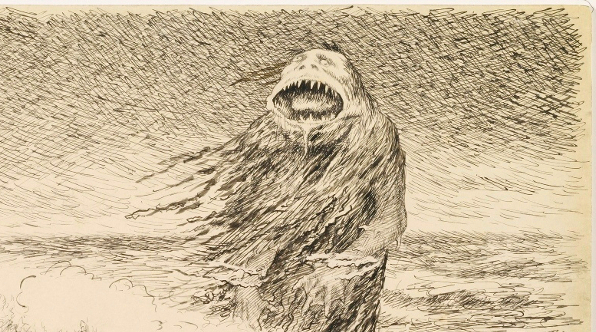 (I) Sjøtrollet – The Sea Troll (1887). Theodor Kittelsen. 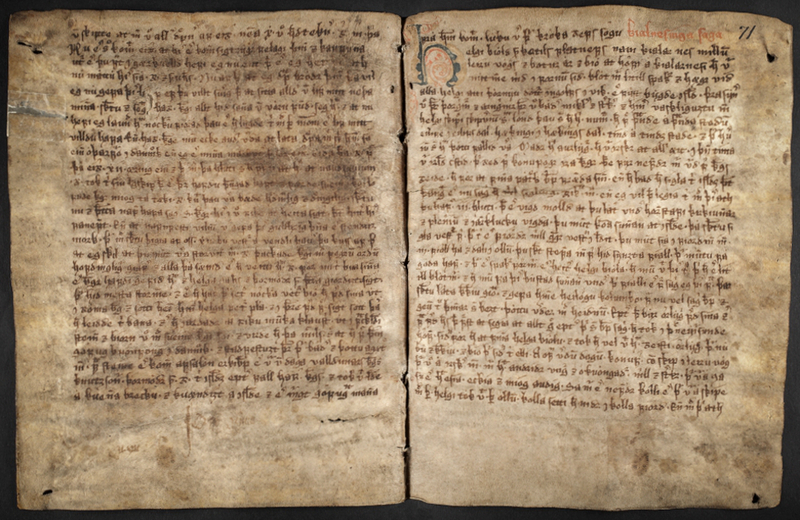 (II) The AM 471 4to Icelandic manuscript of the saga of Ketill from the 15th century. One of the oldest manuscript in which the saga is preserved. © Arnastofnun. (III) A view of Harfnista/Ramstad by flickr user Schwebbes. © 2008. 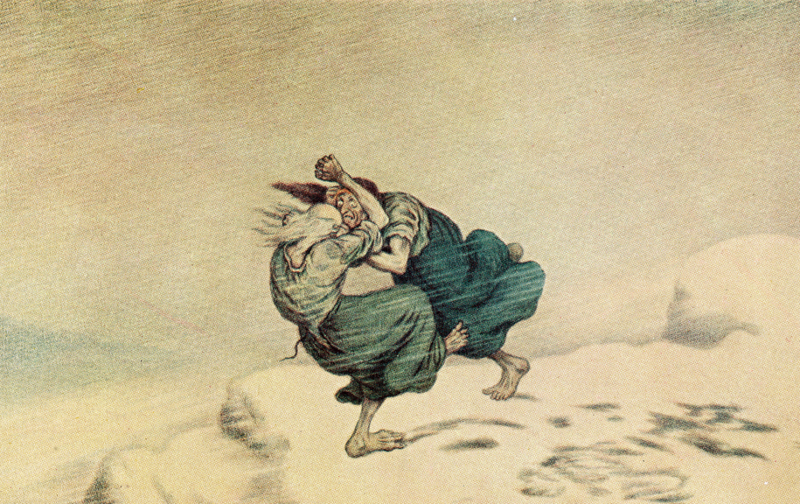 (IV) Troldkjærringer – Troll-hags (1902). Theodor Kittelsen. Digitization by the National Library of Norway.